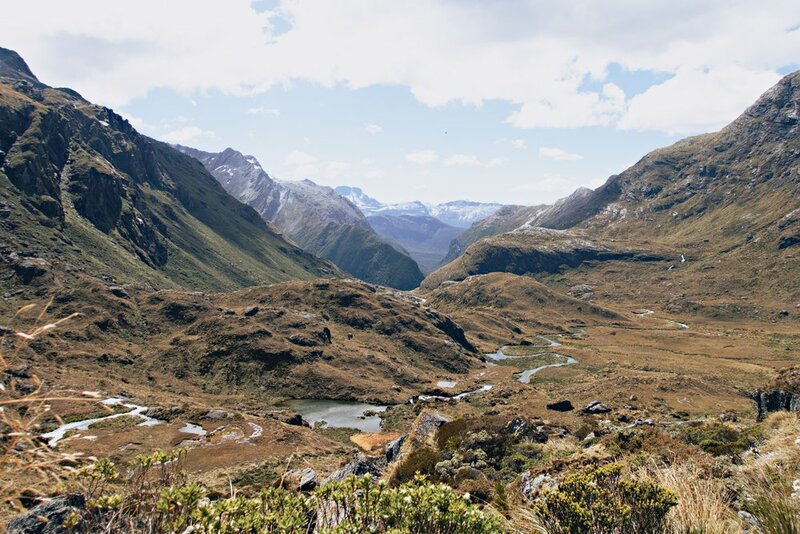 The Routeburn Track is one of the famed Great Walks in New Zealand. There are multiple options to do this track: Day Hike or Overnight Hike, and starting at The Divide or Routeburn Shelter. The Divide is further away from Queenstown (~4 hours drive) and Routeburn Shelter is only an hour away. There are many companies that will help you with transport if you choose to do the thru-hike. We learned by doing this day hike that a day hike from Routeburn Shelter to The Divide is very possible for the experienced hiker. We had originally planned to do an overnight hike, camping at Lake McKenzie. Unfortunately our graduate school changed mandatory dates on us last minute after we had already booked our flights and huts, so we had to pay (a lot of money!!) to change our plans. Since Routeburn was at the end of the trip, we changed our 2 day overnight hike to a long day hike from Routeburn Shelter to The Saddle - with the optional Conical Hill spur - and back. We woke up and headed to Routeburn Shelter on a rare bright and sunny day in Queenstown. The day before it was pouring rain so we were lucky to have good weather! We parked at the lot and started at . We didn’t notice any break-ins, but remember to take your valuables with you anyway. The locals told us to open empty glove compartment boxes too. The track starts off very lightly across several bridges and through a dense forest. We didn't feel the elevation too much going up, but looking at the track profile you're going up 1,650ft in 5.5mi! The scenery doesn't open up until you reach Routeburn Falls. 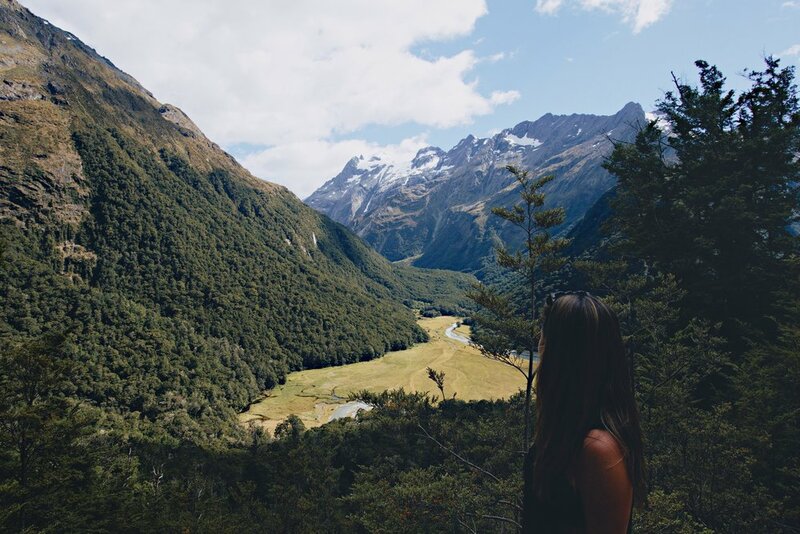 At either Routeburn Flats or Routeburn falls, you have an opportunity to use the restroom and refill water. Because of these quick stops, it's possible to only carry 1L of water on this hike. The huts are luxurious and better than some of the apartments I lived in right after college. Bravo New Zealand DOC! After Routeburn Falls, the forest disappears into a beautiful valley, with a river flowing through it and a large lake. This area looks like the Lord of the Rings movie and "Middle-Earth." Every turn was a new view and even if you're doing a day hike, I would highly recommend finishing this portion to the Saddle. We arrived at the Saddle early and asked one of the guides whether it was more worthwhile to continue on, or do to the Conical Hill spur. He recommended Conical Hill, so we took 1.5 hours to get even higher and have a 360 view of the surrounding valley. After that, we turned back around and half jogged back to the carpark. The way back from Routeburn Falls to the carpark felt a lot longer since the forest scene doesn't change much. It goes by relatively quick though and it's not so steep so your joints and feet will be fine. We found poles to be useful on a long day hike, although you'll want to tuck them away for the Conical Hill spur. The terrain the entire time, like most of the New Zealand hike we've been on, are very groomed and you won't have too much trouble on them. The weather is the key danger factor here, and you'll want to be sure you're properly fitted. Check out my gear list below for some ideas on where to start.